An emotive and iconic animal, the African elephant (Loxodonta africana) is the largest living terrestrial mammal, with the largest recorded individual reaching a height of over 12 feet at the shoulder and weighing over 10 tons. The African elephant’s brain is bigger than any other land animal and its skull is exceptionally large, having evolved to support the trunk and the heavy teeth and jaws. The skull comprises up to 25 percent of the elephant’s total body weight. The Asian elephants (Elephas maximus) are smaller than their African savannah relatives and have many other physical features that set them apart. Their ears are smaller and their back is more rounded so that the crown of the head is the highest point of the body. Elephants are unusual among mammals in that they continue to grow throughout their life, although the rate at which they grow slows after they reach sexual maturity. The African elephant occurs largely in eastern, southern and western Africa while their Asian cousins are now restricted to isolated fragments in parts of Bangladesh, Bhutan, India, Myanmar, Nepal, Sri Lanka, Thailand, Cambodia, Vietnam, China, Laos, Malaysia and Indonesia. The greatest threat to the population of the world's elephant's is the ivory trade, conducted primarily in Asia, which leads to the relentless poaching and slaughter. The secondary threat is the loss of their habitat due to human encroachment. Photographing Elephants is one of the most enjoyable experience for me because they are very similar to humans. They have a social structure, a tight family bond and a life span of about 80 years. A female Elephant has a gestation period of over one and a half years and gives birth to one calf. She is a devoted mother and spends all her time taking care of her offspring. The young are inquisitive and playful. For more posts on photographing other wildlife, you will find Hummingbirds, Polar bears, Bengal tigers, Killer whales and Blue whales adventures here. I have been a wildlife photographer for 25 years using Canon gear. You can read my FAQs on wildlife photography, see my equipment bag and my works on MichaelDanielHo.com. You can also follow my travels on my blog, Twitter, Facebook and Instagram. Elephants are one of my favorite animals to watch and photograph. Excellent wildlife photography on your site and the videos are simply out of this world. Thanks for sharing. 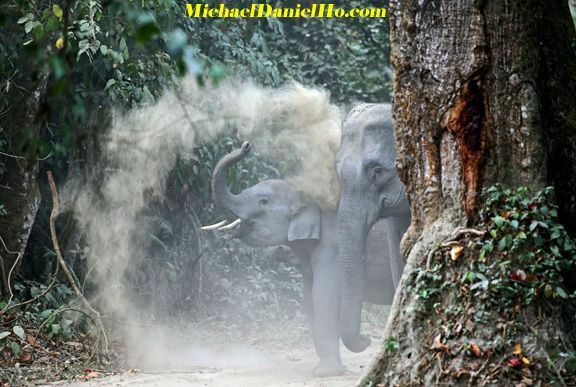 Fantastic post and photos on Elephants. These endangered gentle giants are threatened by poachers and heartless buyers of trinkets made from ivory. We must stop the trade and save them before it's too late.